My recollection is that Automatic Teller Machines used to be much simpler devices, and much faster. I’m sure back in the day I timed myself getting cash using the basic buttons and 1-2 line dot-matrix LED “display” they had back then and had it down to under 30 seconds. These days ATMs are complex beasts with colour screens and animated ads, but the functionality to customers is almost the same as it was back then: put your card in, enter your PIN, do an enquiry (check your balance) or make a withdrawal, from account Savings, Cheque or Credit, enter the amount, then take your cash and card and let the next person have a go. Each transaction takes waaaaaay longer than it used to. 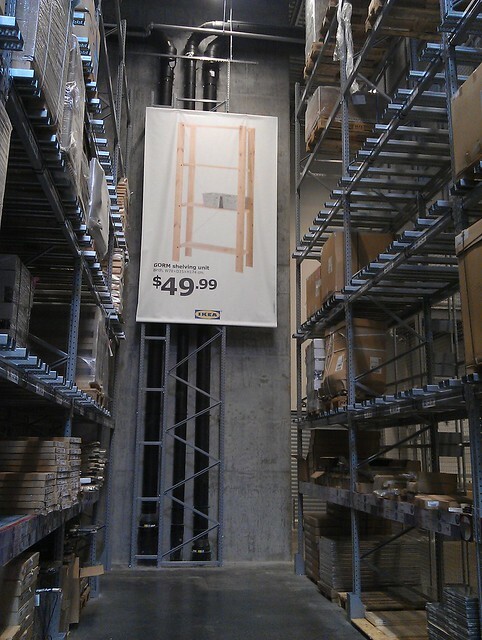 It’s not just the ads, the whole thing seems slower. 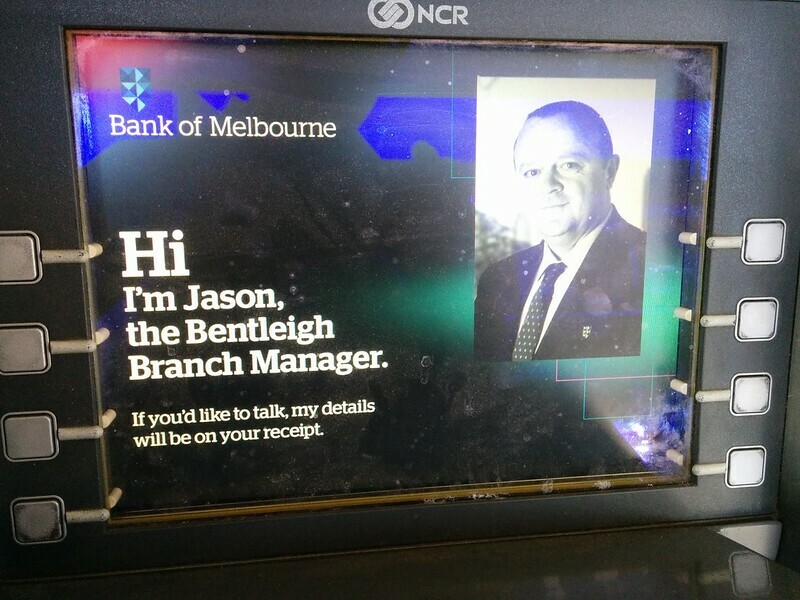 Normally after a few seconds of Jason’s attentive stare, it then warns you to cover your hand as you enter the PIN… despite that Bank Of Melbourne ATMs all seem to have a built-in cover. This time however, it got stuck on Jason. It had frozen up. 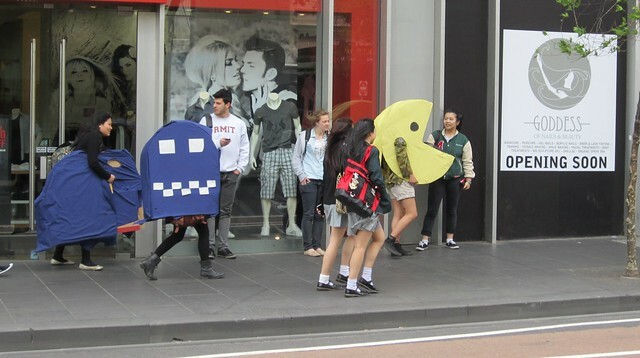 I gave it what seemed like a very generous period of time before I started punching buttons. Cancel, Clear, even that button to trigger the audio prompts through a headphone socket. No response. After a minute or two, it was obviously not going to unfreeze, or give up the card. Jason’s invitation to ring him was still on the screen, but I obviously wouldn’t be getting the receipt with his phone number on it to actually do so… though it was around 6pm anyway; I doubt he’d still be at work. So I found a (barely readable) enquiries phone number on the ATM and rang it. I thought at least if I can get the card cancelled before I walk away, nobody can use it if the ATM spits it out. The bank’s hotline of course had an automatic menu wherein no option quite described the situation I was in. Was the card lost or stolen? Well, not really lost, since I knew it was in this ATM. Stolen? 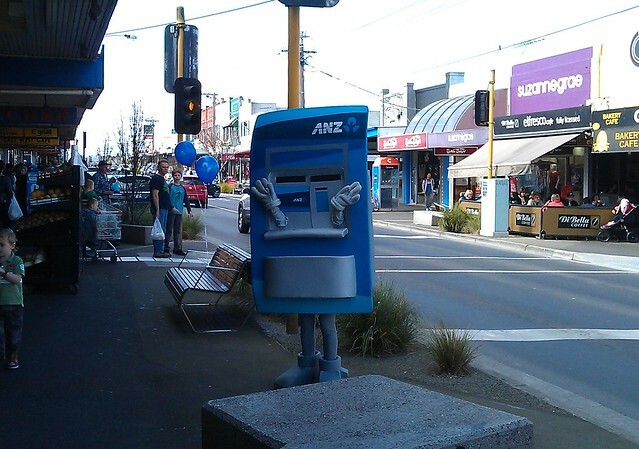 Again, only if you count the bank’s own automaton as having stolen it. I chose the option that loosely approximated my situation, and after trying to tell the machine by way of the phone’s Hash button that I had no idea what my Access Number, Card Number or Access Password was, and some minutes on hold (everybody’s idea of fun), I then spoke to a guy who said he couldn’t help, and he transferred me. All the while I was standing in front of the ATM blocking anybody else using it, hoping I didn’t look like a dunderhead who can’t use such a basic machine, or some kind of ATM-hog. Thankfully nobody else wanted it. The lady I then got transferred to was able to help… at least, after making me answer some security questions (including my verbal password, though she never made clear if I had correctly guessed or not), she cancelled the card and ordered a replacement, and usefully also to connect one of my other cards with the bank to the account I had intended to access. I was able to withdraw cash from another ATM using the second card. Hey cool, maybe I don’t even need the replacement! I also asked her if she wanted to know precisely which of her bank’s ATMs had gone kaputsky. No; she implied she knew already. Perhaps as its last gasp before freezing it sent a message back to base saying it had grabbed my card, and she was able to see that information. Oddly, passing an hour or two later, the ATM appeared to be working again. Or perhaps it was a trap, lying in wait to lure another unsuspecting customer into giving up their card. Hmmm. That might explain a lot. Behold! The temple of Gorm! 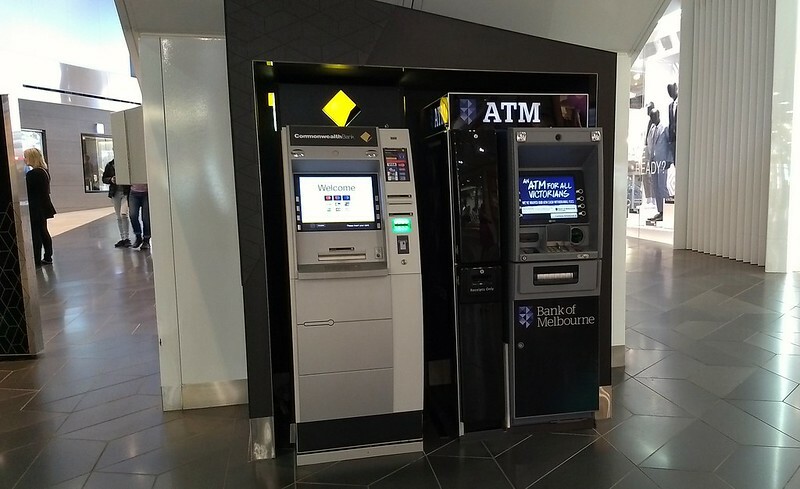 Having moved offices to Latrobe Street, I wanted to know where the nearest ATM is — that is, those of my preferred (no fee) banks, St George or Westpac. 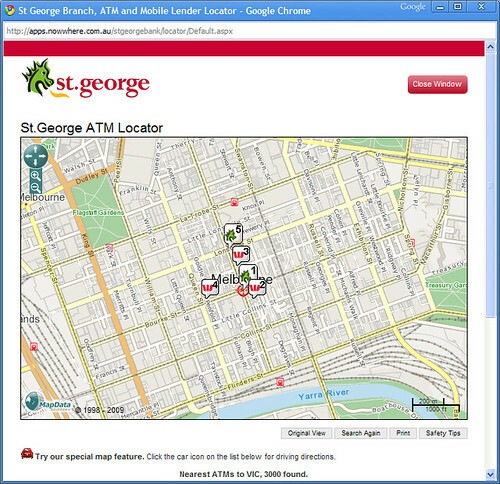 The St George ATM/Branch locator will only show five results — including Westpac ATMs. Searching postcode 3000, it shows me those closest to the the corner of Bourke and Elizabeth Streets, none of which are west of Queen Street. 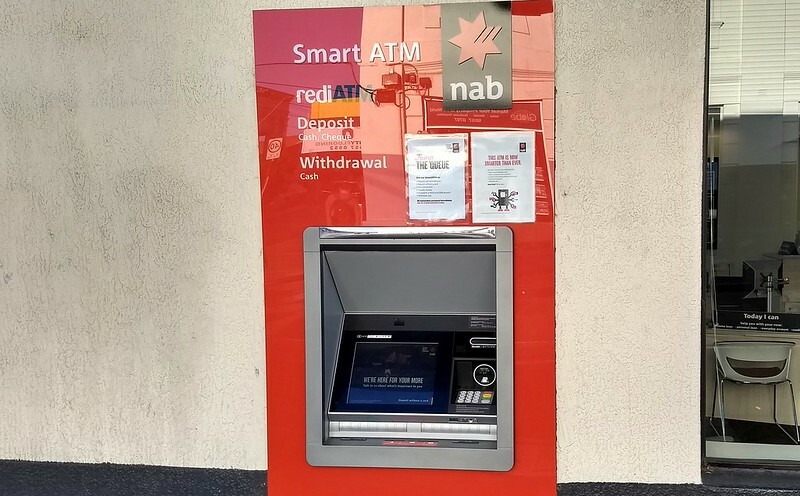 I know of at least one ATM on William Street near Bourke Street, but even when dragging the map around, it won’t show any others. The Westpac site seems a little better, but doesn’t appear to show St George ATMs, only Westpac ones. I’ve sent some feedback to the St George people. Will be interested to see how/if/when they fix it. Update lunchtime: The Commonwealth Bank locator has similar issues if you just enter a postcode, only showing the 5 closest. But it does have the option of entering a full address, but if you don’t spell La Trobe with a space, it (and others) assume it’s Little Latrobe Street, thus showing me ATMs several blocks away instead. The ANZ one shows about 15, none nearby. If you search by street name, like Commonwealth, you have to put the space in La Trobe, otherwise it has real problems. The NAB one seems to show all results, but in pages of 5 per page, and with no combined map, which is hopelessly unuseable. (Imagine that, in 2010!) It allows me to enter a full address, but it has the same problems with La Trobe as the Commonwealth does.